TBILISI, DFWatch–The interim owners of Georgia’s largest anti-government TV channel have appointed the anchor Zaal Udumashvili as new manager, but he rejected the job. The failed attempt to appoint a new manager follows several months of legal wrangling over who shall own Rustavi 2. Tbilisi City Court recently decided that the TV company belongs to the businessman Kibar Khalvashi, but a day before the ruling, the Constitutional Court suspended a legal provision which might have been used by the government to immediately enforce the city court’s decision. A few days later, the city court decided to appoint new interim owners of Rustavi 2 and suspend the status of the current managers, including the company’s top director Nika Gvaramia. All major TV channels in Georgia were supportive of the government during the presidency of Saakashvili, but after the change of government in 2012, most changed their editorial profile into supporting the new Georgian Dream government. Rustavi 2 has remained pro-Saakashvili, and has fought against a takeover under the banner of protecting free speech. 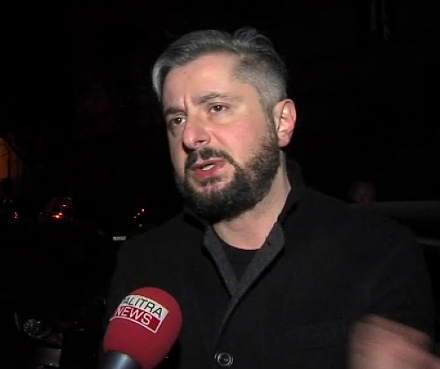 One of the new appointees, Rezo Sakevarishvili, used to be director of Imedi TV, one of the channels perceived to be loyal to the new government. 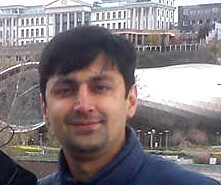 Another is Davit Dvali, who co-founded Rustavi 2 and also wanted to reclaim ownership of the company. 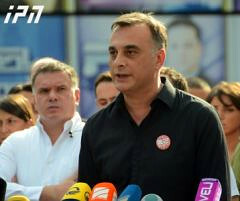 The city court’s decision was criticized not only by Saakashvili’s party, the National Movement, which is looking at the prospect of losing a powerful TV channel as a venue for voicing its views, but also NGOs and foreign diplomats, as well as international organizations. 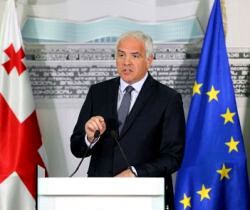 The process taking place is generally seen as an attempt to silence Rustavi 2 – the government’s most powerful media opponent – ahead of the parliamentary election in one year. A few days ago, Sakevarishvili and Dvali addressed the Karamanashvilis brothers, who are partners of the company, and told them that they did not plan to go enter the company’s office until after court proceedings were over Thursday. They planned to wait until lawyers had appealed the decision to appoint new interim owners and until the court proceedings about that appeal were completed. This would include hearings in both Tbilisi City Court and the Appeals Court. Meanwhile, they addressed the Karamanashvili brothers and asked them to choose candidates for new general director and financial director of the company, and said they would support the candidates they picked. “We, the interim managers of Rustavi 2, are deeply interested in the TV company continuing to broadcast without interruptions,” the statement reads. 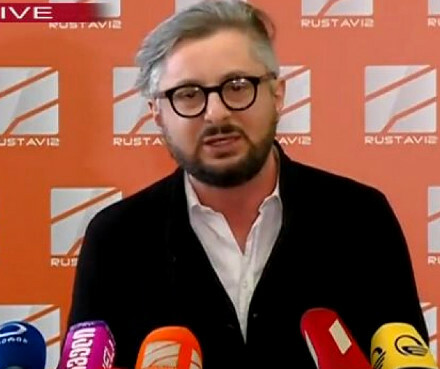 The Karamanashvili brothers did not wish to communicate with them, however Nika Gvaramia responded that the best option would be for Zaal Udumashvili, Rustavi 2’s first deputy director and one of the anchors of its evening news broadcast ‘Kurieri’. Wednesday, Sakevarishvili and Dvali said that they had made up their minds to give Udumashvili authority as general director and that they had registered this decision at the Public Registry. “Two days ago I met the deputy director general of Rustavi 2, Zaal Udumashvili. We discussed this issue. I explained our position, that if both parties wish to avoid tension and for everything to proceed peacefully, I am ready to give him my authority,” Dvali said at a press conference. 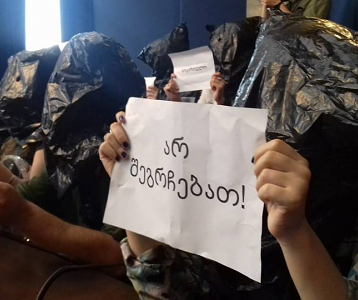 Rustavi 2 responded in a live studio broadcast one hour after Dvali and Sakevarishvili’s statement. Udumashvili said he never agreed to the offer and he doesn’t accept it. He continued saying that he is not a financial expert and cannot take the responsibility. He confirmed that he met Dvali and spoke with him for two hours. “I told him that this is the government’s fight and he is a tool in this fight. He explained his opinion, but of course we didn’t agree. Finally, he asked if I would accept to be interim manager to save the company, but Dvali hasn’t received my approval,” he said. Udumashvili continued saying that he was curious as to how the decision was registered at the Public Registry without his signature and believes that the document is unlawful. “I am deputy director general of Rustavi 2 and I have certain functions. I am chairman of the channel’s editorial policy,” he said.